Mitsuru Fujita – from Zaisyo at Japan Exposures. "...Mitsuru Fujita was born in Tokyo in 1934. He quit a job in advertising to become a freelance photographer in 1961, eventually setting up his own commercial photo agency called Fujitaman in 1966 which he would run for over 40 years. During this time he also taught photography part time at Tokyo College of Photography and at Musashino Art University. Fujita closed Fujitaman in 2007 to concentrate on his personal work." All Folk at The Barbara Archer Gallery in Atlanta, GA. "...an exhibition showcasing works by self-taught artists including Nellie Mae Rowe, Mose Tolliver, Leroy Almon, George Andrews, James Harold Jennings, Sarah Mary Taylor, Henry Speller, Eddy Mumma, J.B. Murry, Jimmy Sudduth, David Butler, Robert Lindsay Walker, Captain William Jordan and various anonymous artists." Students from the Institute of Design: The Harry Callahan and Aaron Siskind Years, 1946 to 1971 at Higher Pictures. "...The exhibition consists of over forty vintage works dating from 1946 to 1971 by accomplished and newly discovered artists who studied with Harry Callahan and/or Aaron Siskind at the influential and highly regarded Institute of Design in Chicago. The commonality and allure in these works signify the materialization of the abstract, modes of experimentation and the discovery of potential." New York Times... Images Of War, Finally Unpacked. "...Somehow, in the summer of 1970, I ended up in an anarchist campground deep in the mountains of Southern France. Most of the campers were young French and Italian live wires, tense, raucous, full of theater. But there was also a contingent of older people, Spanish Civil War veterans, still fugitives after 30 years, living out of the backs of vans. They were the ones I wanted to talk to. I wanted to ask one thing: What was it like to be there back then, at a prophetic moment in modern history, in a war that continues, for some, to be burnished with an ethical glow? But they were reticent, and our jumble of Spanish, French and English probably wouldn’t have taken us far, anyway. After all these years I’ve found some answers to my question in an exhibition called 'The Mexican Suitcase' at the International Center of Photography. The show documents wartime life in Spain between 1936 and 1939 from an insider-outsider vantage: through the eyes of three photographers — Robert Capa, Gerda Taro and David Seymour, known as Chim — who were not Spanish but who were intensely committed to what they saw as a do-or-die anti-fascist struggle." The Mexican Suitcase: Rediscovered Spanish Civil War negatives by Capa, Chim, and Taro at the ICP. Robert & Shana ParkeHarrison: Beginnings at Catherine Edelman Gallery in Chicago, IL. "...Robert & Shana ParkeHarrison began collaborating on photographs shortly after graduate school, when they began constructing and choreographing scenarios about mans affect on the landscape. In these stagings, Robert would dress in a black suit and starched white shirt -- often referred in the press as an Everyman – and interact with the land, creating environmental performances. These surreal images addressed issues about the earth and mankind's responsibility to heal the damage he has done to its landscape. Often acting as earth's protector, healer and communicator, Everyman used low-tech instruments, creating settings more akin to cinema than the family photo album. These ground breaking images can be seen in their first monograph, The Architect's Brother." Bombardement d'une maison (The Last Cartridges) by Georges Méliès (1897) at Europa Film Treasures. "...A group of soldiers take refuge in a derelict house. Some are sent to keep watch; others scan the floor and gather up munitions. The house is bombed just as they fire their last round of ammunition. Here Méliès reproduces Alphonse de Neuville’s eponymous famous painting." Yoshitomo Nara: Nobody's Fool at the Asia Society in New York. "...Yoshitomo Nara: Nobody’s Fool is the first major New York exhibition of the Japanese artist Yoshitomo Nara (born 1959), and features more than one hundred works ranging from his early career in the 1980s to his most recent paintings, drawings, sculptures, ceramics, and large-scale installations. 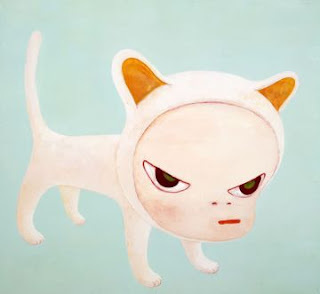 As one of the leading artists of Japan’s influential Neo Pop art since the 1990s, Nara is well known for his depictions of children and animals. Nara’s cute, though often menacing, children and animals are so readily associated with popular culture, particularly manga comics and animation, that viewers may neglect to contemplate his evocative imagery in depth. His popular appeal masks the serious social and personal dimensions of his work—feelings of helplessness and rage, and a sense of isolation in a hyper-networked society." A Woman, A Gun, And A Noodle Shop - a film by Zhang Yimou. Chinese remake of the Coen Brothers' "Blood Simple." Künstlerplakate: Artists’ Posters from East Germany, 1967–1990 at Grey Art Gallery, NYU. "...Surveying the evolution of artists’ posters in the German Democratic Republic (GDR) during the decades preceding reunification in 1989, Künstlerplakate ranges from early examples of the late 1960s to the rich and varied highpoint of the late 1980s. Produced and circulated primarily in East Germany’s three principal art centers: Dresden, Leipzig, and Karl-Marx-Stadt (now Chemnitz), posters served both as advertisements for cultural events and works of art in their own right. Most were printed by or in the presence of the artist, in small editions of less than 100 copies—thus bypassing strict GDR censorship boards." 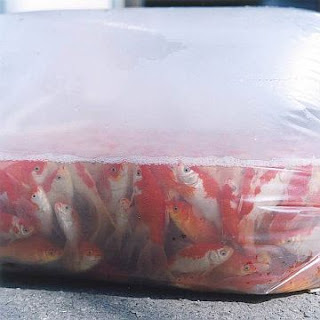 Rinko Kawauchi... Untitled (2009, c-print, mounted on dibond, ed. 6). From the exhibition Rinko Kawauchi: A Glimmer Of Silence at Galerie Priska Pasquer in Cologne, Germany. "...To mark the ten-year anniversary of Galerie Priska Pasquer, we are delighted to present a selection of new works by Rinko Kawauchi. With 'A Glimmer in Silence', Rinko Kawauchi recalls the spirit of the 'Utatane' series with which she entered the art scene in 2001. Today, Rinko Kawauchi is one of the best-known Japanese photographers of her generation." Charles Grogg: Reconstructions at Joseph Bellows Gallery. "...Charles Grogg photographs botanicals and other natural imagery isolated from their natural environments. Taken out of their environmental context and in many cases enlarged on paper beyond their usual size, the botanicals offer themselves up for further study and investigation, allowing the delicacy, grace, and inherent sensual details of the flowers and specimens to become forefront." 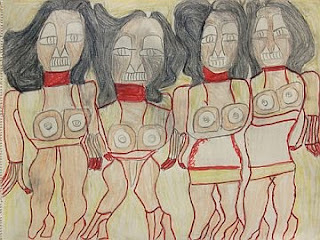 More... Works by Charles Grogg at his personal site. Exploring the Eclectic Harold Gauer Collection at the WHS. "...Trying to explain the images in the Harold Gauer Collection and give them historical context is a difficult proposition. Harold Gauer was a unique individual involved in a such a wide variety of Milwaukee life and events that the collection thoroughly defies being categorized. The collection contains everything from photo shoots with prominent politicians and elaborate costume parties to images of Gauer's work with international aid organization CARE (Cooperative for Assistance and Relief Everywhere). Other gems in the collection run the gamut from surreal collages of text and images to capturing numerous whimsical experiments with spirit gum and false noses to mildly bawdy snapshots of his friends' wives. The images presented in the Gauer collection are consistent only in their giddy inconsistencies." Works by Arnold Odermatt at Koenig Projekte in New York. "...These photographs were taken from the 1950’s through the 70’s while Odermatt was a police officer and official police photographer of the canton of Nidwalden, Switzerland. Joining the police force in 1948, when he was in his twenties, Odermatt assembled a large inventory of 'accident' photographs. During his career, he documented countless vehicular mishaps along Nidwalden’s treacherous roads as well as its quiet village streets. Arriving at the scene of an accident, Odermatt would take one set of photographs for the police and insurance files, and another set for himself."